Briana Nelson Goff, director of the Institute for the Health and Security of Military Families, received the Outstanding Civilian Service Award from Gen.Mark Milley, U.S. Army chief of staff, on Sept. 15, 2016, in Washington, D.C. Also receiving the award were Trace Adkins, country music singer and actor; John G. Bunch, founder of Operation Open Arms; and Spencer Kympton, president of The Mission Continues. she gets! It truly was an honor and an indescribable, humbling experience. 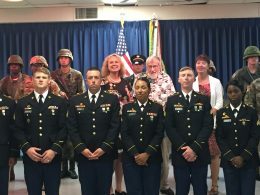 On June 29, 2017, Goff was inducted as an honorary Noncommissioned Officer, or NCO, by the 97th Military Police Battalion, 1st Infantry Division. is a Korean War veteran who served as a sergeant. The ceremony included reciting the creed of the noncommissioned officer and signing the charge of NCO. On Feb. 22, 2017, the second Meet Your Military-Connected Student event took place at Hale Library on the Manhattan campus. Nearly 60 K-State faculty and staff attended the event, which included representatives of military-connected students discussing key issues they face. Attendees rotated through a set of tables to learn varying perspectives and experiences of each military-connected student, ranging from children and spouses of military personnel to those retired from the military. 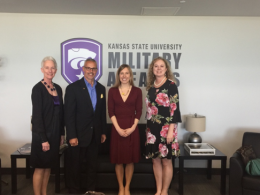 The goal of this event was to help K-State faculty and staff better understand the differences between a traditional college student and a military-connected student, as well as how to support them throughout their academic career. The group discussed what faculty and staff members can do and what changes need to be made at the university to better support military-connected students. Events like this are extremely beneficial as it gives this population an opportunity to be heard. Throughout the 2017 spring semester, the institute worked with the sophomore class of K-State’s First Scholars program. Partnering with the Soldier Family Assistance Center, or SFAC, we had two opportunities to host dinner with soldiers and families from Fort Riley’s Warrior Transition Battalion, or WTB. The institute provided a catered meal and students learned the history of SFAC and the WTB. Fort Riley is home to one of 14 SFACs, and the WTB at Fort Riley supports soldiers from eight states, including Kansas. The students served dinner and interacted with soldiers and families in attendance. As the evening concluded, one soldier shared that he looks forward to these events as a highlight of his week and he tries not to miss the dinners. It was a realization for some students that not everyone has a strong support system. It was a memorable experience and a great way to connect students to families and soldiers. On March 10, 2017, the Combat Aviation Brigade, or CAB, invited students from K-State’s Quest Freshmen Honorary and First Scholars program for a day at Fort Riley to get an inside look into a soldier’s life. The day began with a tour of the CAB, including opportunities for K-State students to see Black Hawk and Chinook helicopters, and observe an aircraft remotely piloted by soldiers on the ground. After lunch, the group toured soldiers’ barracks to see how they live on a day-to-day basis. The students were struck at how the average dorm room differed from a room in the barracks. After visiting the barracks, the students went to Victory Park at the 1st Infantry Division Headquarters. A guest speaker described what each part of the park represented, saying the park was designed to honor and remember fallen soldiers. The group then had the opportunity to meet with Brig. Gen. Pat Frank, 1st Infantry Division deputy commanding general and Fort Riley acting senior commander. 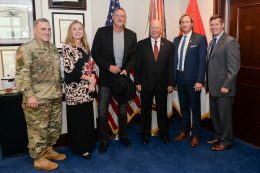 Frank emphasized how unique and remarkable the partnership is between Fort Riley and Kansas State University in promoting and improving the lives of the soldiers and their families. The group then toured some of historic Fort Riley and learned about the U.S. Cavalry and Custer House, ending its day with CAB flight simulations. 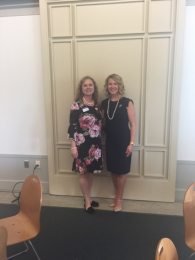 Lisa Silvestri, assistant professor at Gonzaga University, presented research from her book, “Friended at the Front: Social Media in the American War Zone,” on April 20, 2017. Her presentation was part of the annual Huck Boyd Lecture in Community Media, sponsored by K-State’s A.Q. Miller School of Journalism and Mass Communications, and Office of Military and Veterans Affairs. Silvestri described a diagram referencing imagination, interpretation and contemplation, which she said overlap and are critical to life. She referred to the term “field discipline” and how soldiers in the field listen to and for their enemy. She encouraged the audience to listen with a sense of understanding and communicating, adding how crucial it is in life to treat everyone they encounter this way. 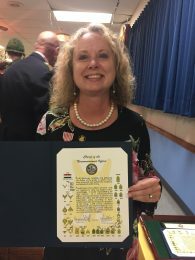 The world would be very different if everyone followed that principle, Silvestri said, and emphasized that as civilians we can make an effort to understand and comprehend issues within the military community. It’s not about serving others, but about seeing yourself in kinship with them. Following the lecture, a focus group discussion was sponsored by the Office of Military and Veterans Affairs with topics including military culture, the effects of social media and the loss of written history caused in part to the rise in everyday social media use. The panelists focused on how social media has affected today’s soldier compared to the pre-social media era. The issues facing today’s military in times of deployment often involve tactical awareness and troop safety, as well as complex and challenging social media situations that arise ahead of military policy. 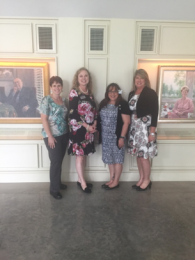 K-State students and military spouses gathered for a luncheon on May 10, 2017, at the Marianna Kistler Beach Museum of Art in honor of Military Spouse Appreciation Day. The luncheon was the second year of recognition celebrations from K-State’s Institute for the Health and Security of Military Families. The luncheon recognizes and honors military spouses from K-State, Fort Riley, the Kansas National Guard and the community. Lisa Hallett, Gold Star spouse and co-founder of the nonprofit wear blue: run to remember, spoke at the event. Hallett lost her husband, Capt. John Hallett, in August 2009 when his Stryker was attacked with an improvised explosive device in southern Afghanistan. Surviving the loss of her husband, best friend and father of her three young children, Hallett turned to running. She soon found a community that needed the same kind of support. Creating wear blue gave Hallett a healthy outlet for her grief and a path to move forward — and she’s committed to sharing that with others. In December 2016, she was appointed by President Barack Obama as a commissioner on the American Battle Monuments Commission. At the luncheon, the institute also recognized three military spouses who were nominated for showing tremendous resiliency throughout their spouses’ military careers, including Karen Cunningham, a K-State staff member and veteran spouse; Roberta “Bobbie” Hanlon, a community member and veteran spouse; and Christine Benne, a community volunteer and veteran spouse. 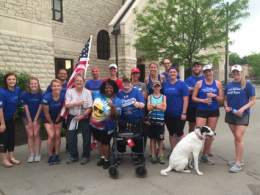 To honor Hallett and her organization the institute hosted a 5K run that evening, with approximately 40 individuals attending. Plans are in the works to start more wear blue runs for the Manhattan area. Contact Suzanne Reese (suzanneb@k-state.edu) for more information. 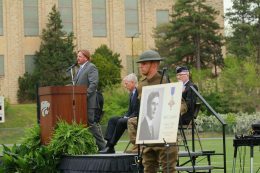 The World War I Memorial Stadium at K-State was officially dedicated on Friday, April 7, 2017. 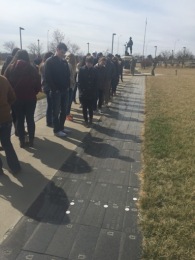 Forty-eight K-State students served in the war but did not make it home. In the last 100 years, their history was lost, and it took a 1996 graduate of K-State to find it. It started with a picture taken during a reunion trip to K-State. Jed Dunham began his career at K-State because, as he says, “Frankly, they took me.” He had no K-State or Kansas connections and arrived in 1989 after attending high school in Switzerland. While at K-State, Dunham was on the lacrosse team. In 2014 he came back for the team’s 25th reunion. On the trip, he took several photos, including one of a small plaque on the wall of Memorial Stadium, or “the Old Stadium” as many called it, where the lacrosse team had played. It was a quick photo, with little thought given at the time. Little did he know that day and that photo would eventually have a profound impact on his life. A few days later, he was going back through the photos he had taken and ran across the one from the Old Stadium. He noted the names on the plaque: 48 total. He looked up a name online out of curiosity, but his search resulted in nothing. How could there be nothing about this person from Kansas? He decided to try another name. Again, nothing. He searched more, with nothing coming up — who were these 48 K-State students with no history? Dunham has devoted the last three years to searching, and even moved back to Manhattan. He has begun to write the unwritten history — the lost stories of the “48 Fallen, 48 Found,” the title of his project — providing a story of the American WWI experience through the eyes of the 48 fallen. 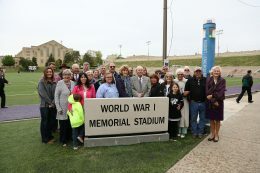 In April 2017, Old Stadium was officially renamed the World War I Memorial Stadium and finally dedicated as a university war memorial.